Gail Ostrishko is a creative catalyst for maximizing human resource potential through a variety of venues. 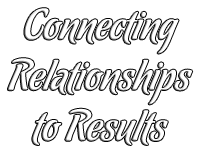 From customized traing programs to facilitating meetings, Gail can help you define and achieve Results through Relationships! Gail embarked on her evolution as an innovative entrepreneur nearly two decades ago as a result of her desire to share her counseling experience with other helping professionals and educators committed to strengthening children and families. She continues to support, encourage and educate those who do the same for others, Thus ‘nurturing the nurturers’ who strive to make our world a better place. Practical Principles and experiential tools are the foundation of her engaging, enlightening and introspective approach to helping people help themselves. Encouragement is contagious! Learn to expect the best from yourself and others and watch as it becomes a self fulfilling prophecy! Train employees to do more of what works and less of what doesn’t while boosting productivity, morale and retention. Ever wish you could write your own ticket’? Ever realize you already do? It takes courage and conscious effort to hear and honor your true calling. Pursue your Passion in a way that increases productivity and job satisfaction. Communication is the single most influential factor determining what happens to people in relationships, careers, and life. Communication is also complicated, multifaceted and most often learned by trial and error. Learn to say what you mean and mean what you say, and confirm congruency in your conversations in this lively interactive session. How do I motivate employees? How do I foster individual responsibility and initiative in such a diverse group of people? Understanding motivation and knowing your colleagues are fundamental to inspiring the best in everyone. Explore styles and strategies for recognizing and developing the talent around you. Creativity is both ability and attitude. It is instrumental for innovative and effective problem solving, yet less than 5% of adults consider themselves creative. Explore challenges and strategies for capitalizing on individual and collective creativity. Change is the only constant we can count on. With Change come choices and challenges. Explore each along with proactive strategies for maximizing these powerful resources. Stress in an inevitable fact of life. How we define and manage stress is paramount to our sense of success and well being. Explore a variety of sources, symptoms and strategies for maximizing the power of this internal energy source. You may be surprised by the power of perception. Learn what a profound impact a positive outlook can have on your life. Why is it when I say one thing you hear another? Explore how culture, gender and other differences influence our ability to communicate effectively.